You Can Fix Anything! 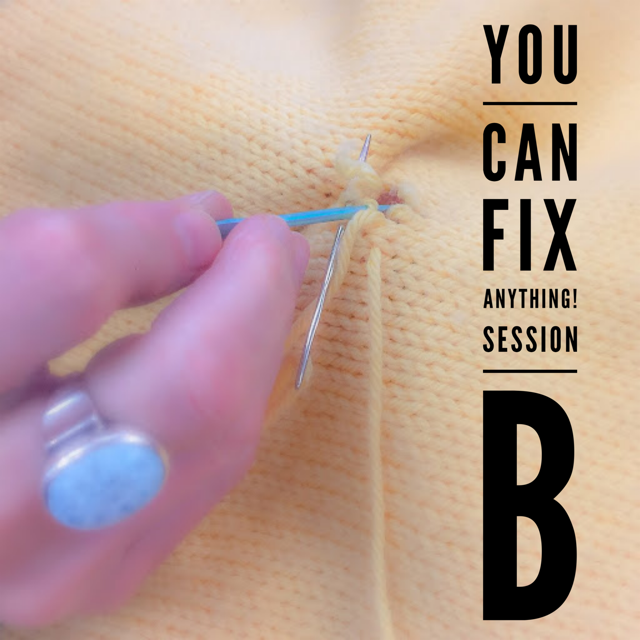 is a three session class series during which you will learn the keys to fixing any mistake in your knitting. This is the second class in the You Can Fix Anything! series. Session A is a required prerequisite for this class, click HERE to sign up for Session A as well. To sign up for the entire three session series and enjoy a tuition discount register HERE instead. All three sessions will make use of the same homework, consisting of six swatches with live stitches on a holder: 1 stockinette, 1 garter ridge, 1 ribbed, 1 seed stitch, 1 lace, and 1 cable (the lace and cable swatches are optional and class can be fully attended without participating in this portion). Knit six swatches (directions for each swatch is included in the homework handout given upon registration). Swatches should measure at least 6 inches by 6 inches. Do not bind of, but rather leave the stitches live and place them on a holder or scrap yarn. Please feel free to attend a drop-in project class or two if you need help with any of the techniques utilized in the swatch knitting. And if you are a newbie to any of these styles of knitting, don’t be intimidated! What a great way to learn, by knitting a 6 inch square with no commitment to the outcome! Two of the swatches, lace and cable, are optional and the class can be attended with the first four swatches only. Requirements: Students must be comfortable with the longtail cast on, knit and purl stitches. If you feel intimidated by the swatch knitting (for example the lace and cable swatches), any of Acorn Street?s drop-in project classes would be a great opportunity to pick up a few more techniques and get some help on the homework before the class begins.